The table features an endgrain (strongest side of wood) top made of Native Texas mesquite and pecan and several other hardwoods. 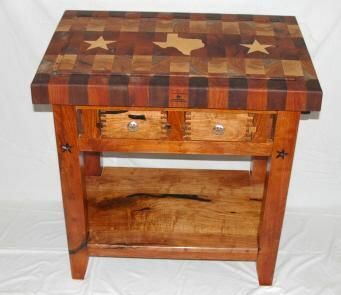 The table features an inlaid maple Texas in the center and a star on either side. The table top measures 24"x36" and is 36" high. The base of the table is mesquite. Other features include two drawers, one shelf and a towel bar. The drawers can be made to pull form both sides or one side. The base has a hand rubbed oil finish and the butcher block top is finished with food grade mineral oil. The table can be made to your specified size. Casters can also be included for easy moving. Dimensions: Table can be customized to your demensions.